22 March - The Duchess of Sussex, Patron, this morning attended a Meeting at Smart Works, St Charles Hospital, Exmoor Street, London W10. 19 March - The Duke and Duchess of Sussex visited New Zealand House in London this afternoon to pay tribute following the horrific tragedy in Christchurch. 17 March - The Duke and Duchess of Sussex attended the christening of Lena Tindall. 13 March - Private Engagement - The Duchess of Sussex, Patron, the Royal National Theatre, this afternoon received Ms Lisa Burger (executive director) and Mr Rufus Norris (artistic director). 12 March - Private Engagement - The Duchess of Sussex, Patron, Association of Commonwealth Universities, this afternoon received Dr Joanna Newman (Chief Executive and Secretary General). 11 March - The Duke and Duchess of Sussex joined the Queen and other members of the royal family for the annual Commonwealth Day service at Westminster Abbey. 11 March - The Duke and Duchess of Sussex attended an event at Canada House to mark Commonwealth Day. 8 March - The Duchess of Sussex joined a panel discussion convened by the Queen’s Commonwealth Trust to mark International Women’s Day. 7 March - Private Meeting - The Duchess of Sussex, Patron, Mayhew, this morning received Miss Caroline Yates (Chief Executive Officer). 6 March - The Duke and Duchess of Sussex attended WE Day UK at Wembley. 5 March - The Duke and Duchess of Sussex joined members of the royal family for a late morning reception at Buckingham Palace to mark the 50th anniversary of the investiture of the Prince of Wales. 28 February - Private Engagement - The Duke and Duchess of Sussex this afternoon held a meeting at Kensington Palace with members of Chatham House, the Royal Institute of International Affairs. 25 February - The Duke and Duchess visited the Moroccan Royal Federation of Equestrian Sports. Next, they attended a cookery demonstration at Villa des Ambassadors in Rabat. The couple met young entrepreneurs supporting youth empowerment at an arts and crafts market in the Andalusian Gardens. In the evening, they met officially with King Mohammed VI of Morocco. 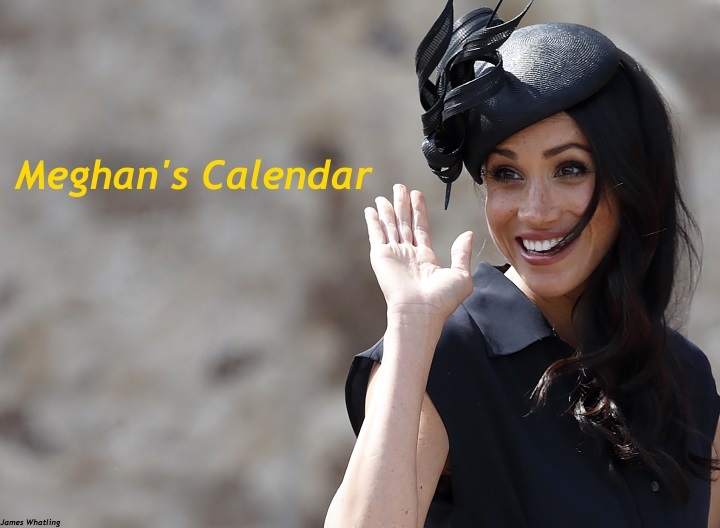 24 February - Harry and Meghan visited the Atlas Mountains to visit organisations Education For All and Lycee Asni to hear more about their efforts to educate girls. At the Education For All boarding house in Asni, Harry invested founder Michael McHugo with his MBE. That evening, they attended a reception at the British Ambassador's residence. 23 February - The Duke and Duchess of Sussex arrived at Casablanca airport, Morocco. 19 February - The Duchess of Sussex visited New York for her baby shower at The Mark Hotel. 13 February - Private - The Duchess of Sussex attended a meeting on empowering communities. 12 February - The Duke and Duchess of Sussex attended a gala performance of 'The Wider Earth' in support of the Queen’s Commonwealth Trust. 7 February - The Duke and Duchess of Sussex attended the Endeavour Fund Awards. 1 February - The Duke and Duchess of Sussex visited snowy Bristol. They began with an engagement at Bristol Old Vic. They also visited One25 and Empire Fighting Chance. 31 January - The Duchess of Sussex visited her patronage the Association of Commonwealth Universities. 30 January - The Duchess of Sussex visited her patronage the National Theatre. 23 January - The Duke and Duchess of Sussex attended the judging of the Endeavour Fund Awards at Kensington Palace. 21 January - Private Engagement - The Duchess of Sussex this morning received Jacinda Ardern, Prime Minister of New Zealand. 16 January - The Duke and Duchess of Sussex attended the premiere of TOTEM - Cirque du Soleil at the Royal Albert Hall. 16 January - The Duchess of Sussex visited her patronage Mayhew in London. 14 January - The Duke and Duchess of Sussex carried out a day of engagements in Birkenhead. They visited Hamilton Square to view a statue erected to mark the 100th anniversary of Wilfred Owen’s death. They visited a new Feeding Britain initiative. Afterwards they visited Tomorrow’s Women Wirral. The final stop of the day was Hive Wirral Youth Zone. 10 January - The Duchess of Sussex visited her patronage Smart Works. 25 December - Christmas Day service at Sandringham. 20 December - Private Engagement - The Duke and Duchess of Sussex visited the Hubb Community Kitchen. 19 December - The Queen's pre-Christmas luncheon. 18 December - The Duchess of Sussex visited the Royal Variety Charity’s residential nursing and care home Brinsworth House. 12 December - Private Engagement - The Duchess of Sussex has a private meeting with the director of the National Theatre. 11 December - Private Engagement - The Duke of Sussex, President, The Queen’s Commonwealth Trust, and The Duchess of Sussex this afternoon attended a Board Meeting at Thomas House, 84 Eccleston Square, London SW1. 10 December - The Duchess of Sussex made a surprise appearance at the 2018 British Fashion Awards to present Givenchy's Clare Waight Keller with the British Designer of the Year Womenswear Award. 6 December - Private Engagement - The Duke and Duchess of Sussex, Joint Patrons, the Royal Foundation, this afternoon attended a Christmas Reception at 5 St Mary Abbots Place. 5 December - The Duchess of Sussex joined university leaders, academics and international scholarship students for an event hosted by the Association of Commonwealth Universities at King's College London. 4 December - The Duke and Duchess of Sussex attended a carol service in Chelsea in support of the Henry Van Straubenzee Memorial Fund this evening. 21 November - The Duchess of Sussex visited the Hubb Community Kitchen to celebrate the success of Together and to see the changes implemented thanks to the proceeds. 16 November - Private Engagements - The Duke and Duchess of Sussex this afternoon attended a Mental Health Innovation volunteers’ workshop at BBC Studioworks, Television Centre, 101 Wood Lane, London W12. That evening, Harry and Meghan joined William and Kate for the annual Royal Foundation dinner. 14 November - Prince Charles' 70th birthday party at Buckingham Palace. 13 November - Private Engagement - The Duke and Duchess of Sussex attended a commemorative dinner at Kensington Palace in honour of African Parks Network. 11 November - On Remembrance Sunday, Harry and Meghan attended the annual Remembrance Day Service at The Cenotaph. That evening, they attended a Service to mark the Centenary of the Armistice at Westminster Abbey. 10 November - The Duke and Duchess of Sussex joined the Queen and members of the royal family for the annual Royal Festival of Remembrance at the Royal Albert Hall. 31 October - In Rotorua, Harry and Meghan visited Te Papaiouru Marae, for a formal pōwhiri and luncheon. Next, The Duke and Duchess headed to Rainbow Springs to learn more about the centre’s kiwi breeding programme. Later that afternoon, The Duke and Duchess headed into the city for the chance to met members of the public gathered there. They travelled to Redwoods Treewalk Rotorua. Harry and Meghan returned to Auckland that evening, before departing for London the following day. 30 October - In Auckland, Harry and Meghan visited the North Shore to dedicate a 20 hectare area of native bush to The Queen’s Commonwealth Canopy. The Duke and Duchess joined the Prime Minister to visit Pillars, a charity operating across New Zealand that supports children who have a parent in prison through the provision of special mentoring schemes. Later that afternoon, The Duke and Duchess had the opportunity to meet the people of Auckland on the Viaduct Harbour, before attending a Reception hosted by the Prime Minister at the Auckland War Memorial Museum. 29 October - The Duke and Duchess visited one of Wellington’s most iconic cafes to meet young people involved in mental health awareness. From Wellington, they travelled to Abel Tasman National Park. That evening back in Wellington, The couple visited Courtenay Creative for an event celebrating the city’s thriving creative arts scene. 28 October - The Duke and Duchess departed on a Royal New Zealand AirForce flight for Wellington. From the airport, Harry and Meghan attended the traditional welcome ceremony on the lawns of Government House. They visited Pukeahu National War Memorial Park where they laid a wreath at the Tomb of the Unknown Warrior, and visited the newly unveiled UK War Memorial. That evening, The Duke and Duchess received official calls from the Prime Minister and Leader of the Opposition at Government House, before attending a reception hosted by the Governor General celebrating the 125th anniversary of women’s suffrage in New Zealand. The Duchess delivered a speech. 27 October - Harry and Meghan spent the afternoon at the Invictus wheelchair basketball finals at the Quay Centre, before attending the Closing Ceremony that evening at Qudos Bank Arena. 26 October - The Duke and Duchess visited St George Building for a call on the Prime Minister S. Akilisi Pohiva and members of the cabinet. From there, Their Royal Highnesses attended an exhibition with The Princess Angelika at the Faonelua Centre. The Duke and Duchess travelled to Tupou College. From there, they visited The Royal Palace for an official farewell with The King before departing for Sydney. That evening in Sydney, Their Royal Highnesses attended the Australian Geographic Society Awards. 25 October - The Duke and Duchess travelled to the city of Nadi in Western Fiji, where they attended a special event at Nadi Airport. From Nadi Airport, The Duke and Duchess took a chartered flight to Tonga, where they were officially welcomed. That evening, The Duke and Duchess visited Consular House in central Nuku'alofa for a private audience with His Majesty King Tupou VI and Queen Nanasipauʻu, followed by an official reception and dinner, and traditional Tongan entertainment. 24 October - Harry and Meghan visited the University of the South Pacific campus in Suva where the Duke and Duchess delivered speeches. Next, the Duchess attended a morning tea at the British High Commissioner’s Residence to showcase women's organisations which operate throughout Fiji. The Duchess travelled to Suva Market to meet some of the female vendors who have become empowered through the project. 23 October - On arrival in Fiji, Harry and Meghan were greeted by a Guard of Honour at the airport, before calling on His Excellency The President of Fiji at Borron House. The Duke and Duchess attended an official welcome ceremony in the city centre's Albert Park. From there, The Duke and Duchess departed Albert Park for the Grand Pacific Hotel to attend a Reception and a State Dinner. 22 October - Harry and Meghan travelled to Queensland’s Fraser Island. Harry carried out several engagements before the Duchess rejoined him for a walk along the picturesque Kingfisher Bay Jetty. 21 October - Harry and Meghan watched some elements of the Invictus Games sailing, and attended a lunchtime Reception hosted by the Prime Minister, with Invictus Games competitors and representatives from the community in the city’s central parkland, The Domain. That evening, they attended a private Invictus Games Foundation event. 20 October - The Duke and Duchess began with an embargoed engagement, unveiling an Anzac Memorial in Hyde Park. The Duke and Duchess travelled by boat to attend the Invictus Games Sydney 2018 Jaguar Land Rover Driving Challenge on Cockatoo Island. In the evening, Their Royal Highnesses attended a Reception hosted by the NSW Premier, inside the Opera House, prior to attending the Invictus Games Sydney 2018 Opening Ceremony. 19 October - Harry and Meghan visited Bondi Beach, one of Australia’s most famous landmarks. The Duke and Duchess met a local surfing community group, known as OneWave, raising awareness for mental health and wellbeing in a fun and engaging way. Later that morning, they participated in a youth advocate programme that aims to unite and inspire young people to be advocates for cohesion and inclusion in their communities. Following this event, the Duke climbed the Sydney Harbour Bridge to officially raise the Invictus Flag, marking the arrival of the Invictus Games to Sydney. Harry and Meghan concluded the day with calls on the Leader of the Opposition at Admiralty House, and the Prime Minister at Kirribilli House. 18 October - A day in Melbourne began with a short walk to Government House, meeting members of the public along the way, before attending an official Reception at Government House. The Duke and Duchess visited a social enterprise café which offers leadership, mentoring and training programmes for young Aboriginal people. In the afternoon, Harry and Meghan visited a primary school to meet students who are involved in sustainability programmes. The Duke and Duchess travelled on a Melbourne tram to South Melbourne beach, where they met volunteers from a local beach patrol programme. 17 October - In Dubbo, The Duke and Duchess visited the Royal Flying Doctor Service. With most of the state of New South Wales suffering from drought, Their Royal Highnesses saw first-hand the hardships local farmers are facing by visiting a local property. The Duke and Duchess joined locals in Dubbo for a picnic. In the afternoon, The Duke and Duchess visited a local school working to improve the education outcomes of young Aboriginal and Torres Strait Islanders. 16 October - The first day of the tour began in Sydney at Admiralty House, where the Duke and Duchess attended an Invictus reception. The Duke and Duchess travelled to Taronga Zoo to officially open the new Taronga Institute of Science and Learning. The Duke and Duchess then visited Sydney Opera House and viewed a rehearsal of Spirit 2018. The first day of the visit concluded with a Reception hosted by the Governor-General at Admiralty House. 15 October - The Sussexes touched down at Sydney Airport. 12 October - The Windsor wedding of Princess Eugenie and Jack Brooksbank. 3 October - The Duke and Duchess of Sussex made their first official visit to Sussex. In Chicester, they were shown the rare Sussex copy of the American Declaration of Independence. They officially opened the University of Chichester's Engineering and Digital Technology Park. Harry and Meghan's first stop in Brighton was the iconic Royal Pavilion. They visited Survivors' Network, a charity that supports survivors of sexual violence and abuse. The final engagement of the day was a visit to JOFF Youth Centre in the coastal town of Peacehaven. 25 September - The Duchess of Sussex attended the opening of ‘Oceania’ at the Royal Academy of Arts. 24 September - The Duke and Duchess of Sussex joined more than 200 young Coach Core apprentices for the Coach Core Awards at Loughborough University. 20 September - The Duchess of Sussex hosted a celebratory event at Kensington Palace to mark the launch of Grenfell cookbook 'Together'. Prince Harry and her mother Doria Ragland joined her. 11 September - Private Engagement - The Duke and Duchess of Sussex this afternoon received Mr Edward Lane Fox upon relinquishing his appointment as Private Secretary to Their Royal Highnesses. 6 September - The Duke and Duchess of Sussex attended 100 Days to Peace, a gala music evening in aid of Heads Together, Help for Heroes and Combat Stress. 4 September - The Duke and Duchess of Sussex attended the annual WellChild Awards at The Royal Lancaster Hotel. 29 August - The Duke and Duchess of Sussex attended a gala performance of Hamilton in support of Sentebale at the Victoria Palace Theatre. 4 August - Prince Harry was the Best Man at the Surrey wedding of Charlie van Straubenzee and Daisy Jenks. Meghan joined him for the day. 26 July - The Duke and Duchess of Sussex attended the Sentebale Polo Cup. 25 July - Private - Prince Harry's private secretary, Mr Edward Lane Fox was received by The Duke and Duchess of Sussex when Harry invested him with the Insignia of a Lieutenant of the Royal Victorian Order. 17 July - The Duke and Duchess of Sussex officially opened the Nelson Mandela Centenary Exhibition at Southbank Centre's Queen Elizabeth Hall. 14 July - The Duchess of Sussex and the Duchess of Cambridge attended the Ladies' Singles Final at the Championships, Wimbledon. 11 July - The Duke and Duchess began day two in Dublin with a meeting with President Michael D Higgins. The Royals viewed a Gaelic Sports Festival in GAA HQ. At Trinity College, they viewed the Book of Kells. They visited the famine memorial at Dublin's docklands and toured EPIC, the Irish Emigration Museum. The visit concluded with a visit to DogPatch. 10 July - The Duke and Duchess of Sussex spent two days in Dublin, Ireland, at the request of Her Majesty's Government. They met with Leo Varadkar on Merrion Street. Afterwards, they attended a summer garden party at the British Ambassdor's headquarters. 10 July - The Duke and Duchess of Sussex joined The Queen and members of the royal family for a service at Westminster Abbey to mark the centenary of the Royal Air Force. The royals gathered on the balcony of Buckingham Palace to view a special flypast. Afterwards, Harry and Meghan attended a reception with veterans. 9 July - The christening of Prince Louis. 5 July - The Duke and Duchess of Sussex attended the ‘Your Commonwealth’ Youth Challenge Reception at Marlborough House in London. 1 July - Day Two: Audi polo challenge 2018. 30 June - Day One: Audi polo challenge 2018. 26 June - The Duke and Duchess of Sussex joined the Queen at Buckingham Palace for the Queen’s Young Leaders reception and awards ceremony. 26 June - Private Engagement - The Duke and Duchess of Sussex, Joint Patrons, the Royal Foundation of The Duke and Duchess of Cambridge and The Duke and Duchess of Sussex, today attended a Board Meeting, 5 St Mary Abbots Place, London W8. 19 June - The Duke and Duchess of Sussex attended the opening day of Royal Ascot. 14 June - The Queen accompanied by The Duchess of Sussex undertook a day of engagements in Chester. They officially opened the Mersey Gateway Bridge and the Storyhouse Theatre. Her Majesty and Meghan also attended a lunch at Chester Town Hall. 16 June - The wedding of Harry's cousin Celia McCorquodale and George Woodhouse. 9 June - Trooping The Colour, The Queen's Birthday Parade. 22 May - The Duke and Duchess of Sussex attended the Prince of Wales' 70th birthday patronage celebration in the gardens of Buckingham Palace. 19 May - The Royal Wedding of Prince Harry and Meghan Markle. 25 April - Meghan Markle joined Prince Harry and Prince William for the Anzac Day Service of Commemoration and Thanksgiving at Westminster Abbey. 25 April - Prince Harry and Meghan Markle attended the ANZAC Day Dawn service at Wellington Arch. 23 April - Prince Harry and Meghan Markle attended a memorial service to commemorate the 25th anniversary of the murder of Stephen Lawrence and to celebrate his life and legacy. 21 April - On Her Majesty's 92nd birthday, Harry and Meghan joined members of the British Royal family gathered at the Royal Albert Hall for the Queen's Birthday Party. 21 April - Prince Harry and Meghan Markle attended a reception hosted by the Hon Malcolm Turnbull, Prime Minister of Australia and his wife Lucy, celebrating the forthcoming Invictus Games Sydney 2018. 19 April - Prince Harry and Meghan Markle attended a CHOGM Women's Empowerment reception at the Royal Aeronautical Society. 18 April - Prince Harry and Meghan Markle attended a reception with delegates from the Commonwealth Youth Forum at Queen Elizabeth II Conference Centre. 6 April - Prince Harry and Meghan Markle attended the UK team trials for the Invictus Games Sydney 2018 at the University of Bath Sports Training Village. 23 March - During a packed day in Belfast, Harry and Meghan visited the Eikon Centre in Lisburn, the Crown Liquor Saloon, the Belfast campus of Northern Ireland’s next generation science park, Catalyst Inc and the Titanic exhibition. 12 March - Prince Harry and Meghan Markle attended the Commonwealth Day service at Westminster Abbey. 8 March - Harry and Meghan marked International Women's Day in Birmingham. At Millenium Point, they attended an event which aims to inspire the next generation of young women to pursue careers in Science, Technology, Engineering and Maths (STEM). Next, they visited Nechells Wellbeing Centre to join Birmingham's Coach Core apprentices. 28 February - Meghan joined Prince Harry and the Duke and Duchess of Cambridge for the first annual Royal Foundation Forum in the Auditorium at the offices of Aviva, London. 13 February - Prince Harry and Meghan Markle carried out their first official visit to Scotland, with several engagements in Edinburgh. They visited Edinburgh Castle, Social Bite and attended a reception at the Palace of Holyroodhouse. 1 February - Prince Harry and Meghan Markle attended the annual Endeavour Fund Awards at Goldsmiths' Hall. 18 January - Harry and Meghan visited Cariff, Wales for a day of engagements. They visited Cardiff Castle, Star Hub and met with representatives from Street Games. 9 January - Prince Harry and Meghan Markle visited Reprezent 107.3FM in Brixton. 25 December - Harry and Meghan spent Christmas at Sandringham with the royals. 1 December - Harry and Meghan Markle marked a major royal milestone as they carried out their first official engagements in Nottingham. They visited the Nottingham Contemporary which hosted a Terrence Higgins Trust World AIDS Day charity fair. Next, they met representatives with Full Effect at Nottingham Academy. 27 November - The engagement of Prince Harry and Meghan Markle. Charlotte! Can I confess that I am nervous for you, now keeping up with two very active calendars? But moreso, I am exceedingly grateful for your thoughtful posts covering a breadth of issues related to the royals and always highlighting the missions of those organizations involved. This is my go-to source for informative, well-balanced, and excellent posts! I second that. Charlotte you are a gem! Completely agree! I'm one of those crazy Americans who love following the Royal Family and I enjoy both blogs so much! Thank you for all your hard work and dedication! Not to sound like a complete copy cat but YES I too completely agree with these posts. I also love the British Royal Family and am very thankful that you not only post their activities but also that you do such an amazing job. So thank you! I'm with Lacy above! I rarely comment , watch frequently - and, Charlotte- I can not imagine the new workload with this! It is clear that you are a perfectionist ( I mean that positively!) and want to do everything " just right". It surely comes across in your blogs- but this could easily be too much! oh my goodness! Charlotte- you are amazing! Between this and Duchess Kate are my first thing I look at every morning on my computer. I completely agree with the above comments about Charlotte's work on the Duchess Kate blog and this one. These are two sites I visit daily. I appreciate the work that Charlotte does and I learn so much! Thank you for all you do on these sites. Happiness seems to exude from Prince Harry in these photos. Happiness is absolutely contagious when you look at them together. Absolutely delightful! Prince Harry and Meghan's happiness is contagious. Love is grand! It crossed my mind that Harry and Meghan may have been invited to Anmer this weekend and that Kate was going down on Friday to make sure everything was ready for them.It will be increasingly difficult for them having any private time at Kensington Palace. You are the best! Have loved reading about Kate and look forward to following Megan. Your posts are wonderfully attractive and informative. Thanks for ll the work you do. This is my go to info bank for anything about this two. Thank you very much. These are exciting times and it’s wonderful to see Harry so happy. I truly hope Harry & Meghan forge a strong bond with William & Catherine, Both of Diana’s sons have so much to offer & their wives support is invaluable. If Meghan learns from Catherine she will be in safe hands. I like this royal couple, prince Harry and Meghan are the perfect match; seeing them together warms the heart of millions of people around the world, and makes everyone feel the power of love, I mean true love. Happiness and love of this fantastic royal couple is contagious and lightening. It's always very nice to look at them. What a wonderful couple! Looking forward to celebrating their wedding soon. well this is my first time to comment. Would like to say from the US that this is the best coverage of the Young Royals that I have been able to find. I check on both your blogs as often as I can, mostly daily. I was in London last August and a lot of things I learned here helped me enjoy my visit. So would like to thank you for all your hard work. I do have one question about something I have noticed in most picture of William and Harry. Is there some reason they always hold their hands in front of them, you know hold left hand with right out in front. Is this something they are taught to do to keep from fidgeting or something else? Just curious. You do an amazing job. Your blog is extremely professional, thoughtful and thorough. Christina from Mississippi. Could you please move M's calender (right below the header, where now "about" sits)to the 2nd position like on the Kate site for readers' convenience? Charlotte, would there be any way you could include the approximate time of events when available? It would help us know when to check back for updates! I love the past appearances section! Thank you. Hi Charlotte! Thanks so much for this terrific blog and for all of your hard work. Just a small typo I found - I believe the Battle of Amiens calendar event should show August 8th rather than July 8th. Thanks again! Charlotte, thank you so very much for doing this blog. I have especially enjoyed the pictures and videos at every engagement of the Duke and Duchess of Sussex on the Royal Tour 2018. Take a break, you deserve it. Your coverage of the Duchess' baby shower in NYC was wonderfully outstanding! What wonderful friends she has. She looks so happy! I think we might see her on 11th March as well for the Common wealth day. What do you think?